\I did something really stupid the other day. My husband was gone, and I was home with four extra boys, a new, untrained puppy, whose bladder is the size of a sesame seed, and a potty-training three-year-old, Ethan. I was frustrated and overwhelmed, and I irritable because the first words out of my mouth when my husband got home were just plain old dumb. Ethan didn’t want daddy to help him put on his jacket and shoes, so my husband told Ethan that he was tired of him always wanting me, and my husband left Ethan in the mudroom without getting dressed for the outside. The words vomited out of my mouth before I could retrieve them. I told my husband that he was acting like a three-year-old. Youch! It was really disrespectful. Why can’t I keep my lips zipped and not let hurtful words come spewing out? The definition of self-control is: Constraint exercised over one’s own impulses, emotions, or desires (Webster-Merriam). This situation clearly shows that I was– and am– lacking in my self-control. I didn’t even realize I was feeling this way until the words had already slipped from my tongue..
For many of us, the idea of self-discipline is saying “no” to that gooey, chocolatey brownie or not indulging in the whole bag of potato chips. While these have to do with self-control, how we act and behave are other forms of it. Self-control seems impossible to achieve and is held in high esteem as a reult. It’s the last of the fruits of the Spirit because all other fruits are required in order to achieve self-control. If we can’t exercise control, we love too much or not enough. We have too little patience or not enough, which can lead us to become irritable and pushy. Apply these same ideas to the other fruits of the Spirit, and you soon realize that self-control is needed in each of these. We also are prone to sin more when we lack this essential fruit. Our anger can blow up, cause relationship problems, and drive us to do things contrary to what God wants. Or, our lust can drive us to hook up with someone other than our husband. In the Christian life, our restraint can make or break our walk with God. Temptation can lead us to break God’s laws, but focusing on good things– at the expense of other things– can also cause problems. Serving God, but failing to serve our family/take care of them, may even sound like a good thing. But without control, the problem arises. It’s an issue involving balance, and no one can get this balance right, except for Jesus. 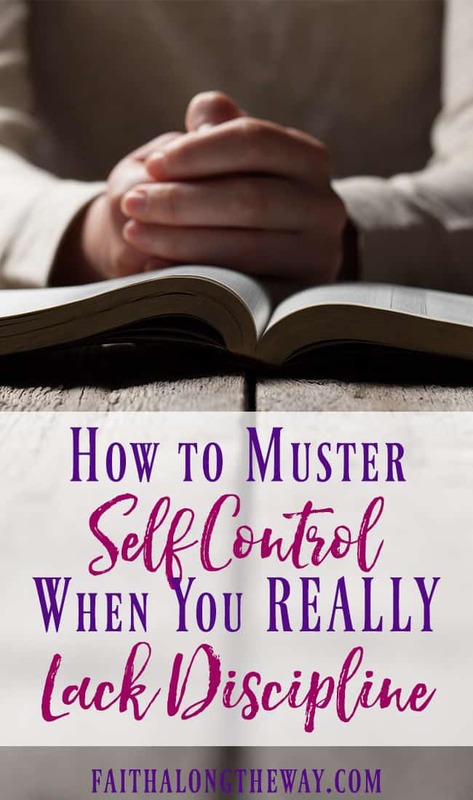 The greatest role model of self-control is Jesus. The temptations of the world were present with Him, yet He refrained from sinning. At any moment, He could have yielded His sovereign power; instead, he restrained it. He didn’t have to stay on the cross, yet he endured the suffering and pain because He loves us. We fail every day with our self-restraint; therefore, Jesus left us with the Holy Spirit to help us in our Christian walk. Also, we are never without His help, and He can help us with this very thing. 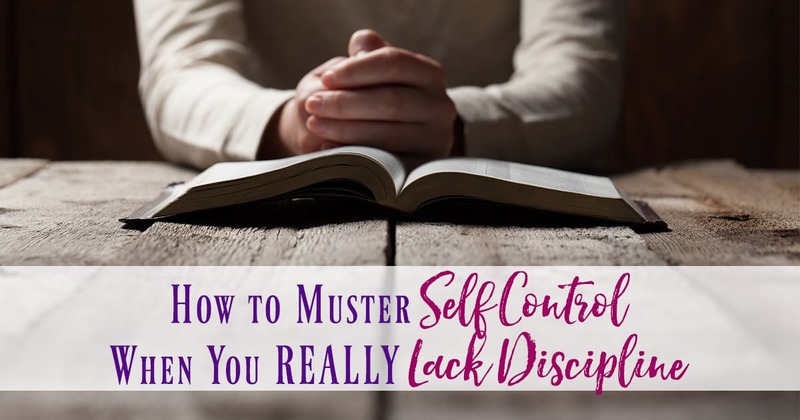 With the Holy Spirit, we can master self-control, even when we REALLY lack discipline. We aren’t in this alone, and God promises to help us strengthen and grow this fruit. Focus your mind, feelings, and behavior on God’s truth. Depend on God when tempted and ask Him to strengthen you. Ask God to forgive you when you make a mistake. Find an accountability partner to keep you encouraged in the right direction. Daily ask for God’s help and for Him to increase this fruit of the Spirit. Obey promptings and convictions from the Holy Spirit when they are evident. Ask God to create the desire to obey His laws. Spend time with God learning His truth and growing in a relationship with Him. Expect mistakes and failure along the way. Mastering our self-discipline isn’t something God just does for us; we need to be intentional on our part also. We work in tandem with God and do some of the work; He does the rest. As sinful beings, we will make mistakes, but through these mistakes, we learn and grow. Someday in Heaven, we will have the perfect balance of all the fruits and our self-control. God gives us the power to transform our lives, so we need to stay close and ask Him to help us! How you find self control even if you’re not disciplined by nature?